This is "Sending" page in EurekaLog project's options. This page consists of two parts: there is a list of available send engines on the left. The rest of the area is changed depending on your send engine's choice. 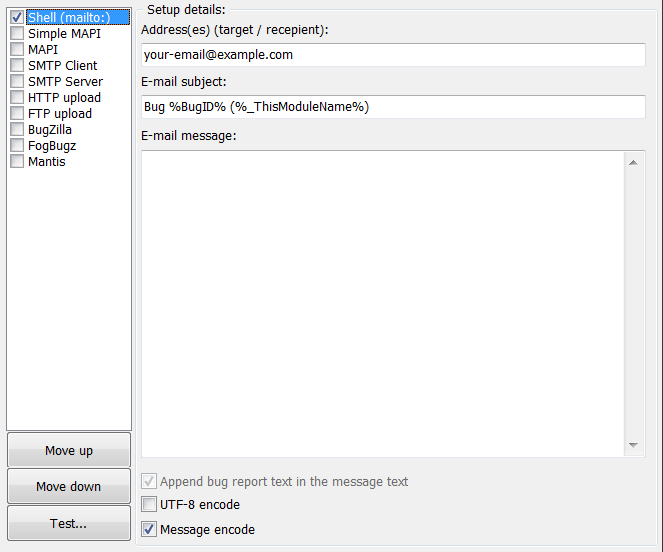 You can select (enable) one or several sending methods for your application. If you select more than one method - each send method will be executed one after another until successful send occurs. You can change order of sending via move up/move down buttons. You can test sending of currently selected method with current options by clicking on "Test" button in the bottom-left corner. There are also additional sending options available on sub-category: Sending options. _BugText="(Error Message) This is a demo bug report from EurekaLog connection testing." _EL_OSType="Microsoft Windows Vista (64 bit)"
_EL_StepsToReproduce="(Steps to reproduce) I've clicked on \qTest\q button on \qSending\q tab"
Those overrides will not be saved in your executable, you can use them only for testing. Note: You may alter send methods at run-time with .SenderClasses property. For example, you may clear .SenderClasses property and then use .AddSenderClass helper method to add one or more send methods.